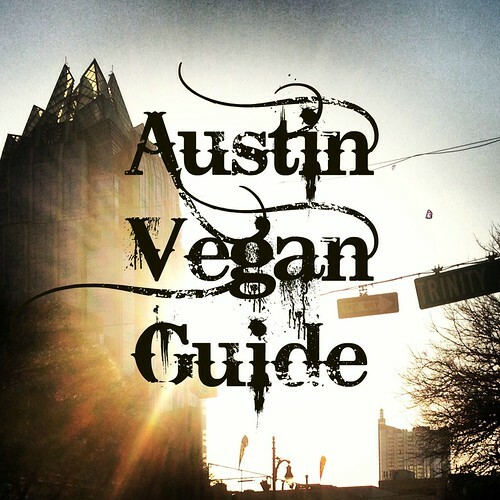 A while back my friend Kristen told me about an idea she had where a group of vegans would storm Austin’s more elegant restaurants and see who could treat vegans the best. I thought it was a really great idea so as time went by I began to think about it as my idea and then I stole it. Whatever, she totally stole my idea that she would open an all vegan bakery walking distance from my office. The premise is that once a month a small group calls ahead and lets them know we are coming and then sees what the chef could come up. Lenoir, like several other places we plan to go, is kind of a cheat because they already have a menu that can be vegan friendly unlike, say, Eddie V’s Edgewater Grill. A week before I wrote to Lenoir and I got a very kind response from Jessica telling me that Chef Todd would be happy to prepare us something. Todd Duplechan and Jessica Maher are actually married and opened the restaurant together earlier this year. Todd used to be the chef de cuisine at Trio, the fancy downtown restaurant at the Four Seasons downtown and Jessica is a pastry chef. I had been to the restaurant a couple of times before in its previous incarnation of Somnio’s and I couldn’t believe how much they have done with the tiny cottage house. 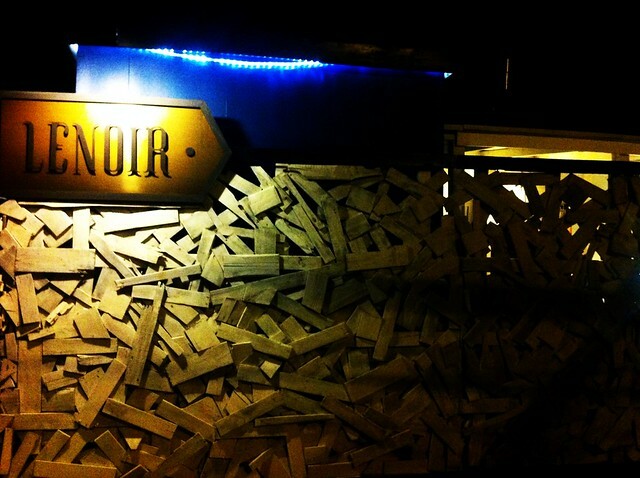 It was really dark when we were there so all my pictures are pretty terrible so I recommend you check out this review from the Austin Chronicle or the South Austin Foodie to see what it really looks like. The interior is beautiful and unique with white curtains everywhere, lots of soft lighting, and even a big communal wooden table in the middle. Then menu is very simple, it is divided into four categories: field, sea, land, and dream (aka dessert). You can order three entrees from any category for the 35 dollar prix-fix meal though Nanette, who is a big fan of the restaurant, let us all know that usually all the vegan options are typically under “field” and not all of them are vegan. Since we’d called ahead of time Chef Todd put different components from different dishes together for us, and then came out and explained each one. 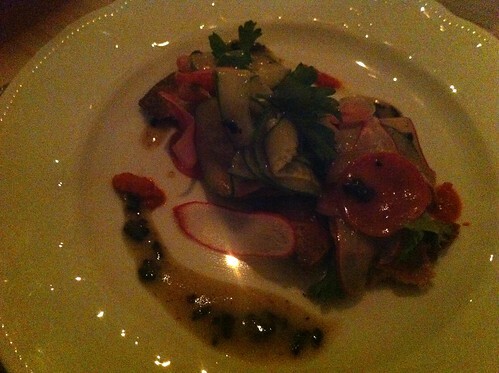 We started with a beautiful radish cucumber salad with a black garlic dressing served on a coconut flat bread with chow chow hot sauce on the side. I’m a big fan of black garlic and I really enjoyed the dressing, which was made with poached meyer lemons, over the thinly sliced vegetables. It was creamy and delicious and had that quality that I can’t really describe, where it hits every part of your palate at once. I didn’t care for the parsley on top because all the flavors went together really well and the parsley tended to overpower the vegetables but otherwise I enjoyed it. The coconut flatbread at the bottom really added a unique flavor and texture. Chef Todd told us that he doesn’t taste any of the entrées put together, he leaves that to his wife. 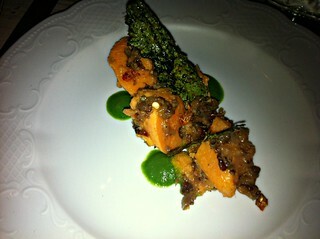 Next we were served a sweet potato dish with granola and an arugula sauce topped with kale chips and chilies. I really enjoyed the autumn flavors and I thought the kale chips were the perfect bit of crunch with the soft vegetables. I’m kind of surprised they aren’t more common and I am going to have to remember using them for garnish in my own cooking. The whole dish sounds kind of like hippie vegan food now that I think about it, granola, root vegetables, arugula, and kale chips all scream “I love the farmer’s market” but it was well composed. I learned that they do pick up most of their produce from the farmer’s market, Johnson’s backyard garden and the other local farms. The next dish was what seemed like the tables favorite and definitely the most hearty course. Summer squash was wrapped around quinoa, and eggplant on a curry sauce with corn and pomegranate seeds and then topped with fried okra. I couldn’t stop talking about the pomegranate seeds and the bit of pop they added to this dish. The fried okra was wonderful, as it always is, but especially in this non-breaded, non-greasy capacity. 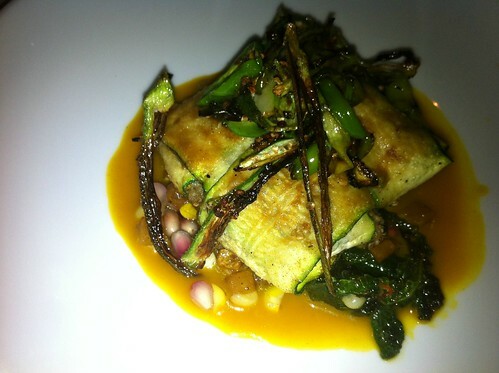 I loved that Chef Todd made sure we had a protein rich element in the meal because too often when you go to nice restaurants you just get pure vegetables and that is not filling enough for your average person. There is nothing worse than spending a hundred dollars on a meal and then having to grab a veggie burger or something on the way home because you are unsatisfied. I loved this dish, the curry was brilliant and the whole thing came together really well. The whole meal we were kind of in suspense about whether our fourth entree would be dessert or not and we were pretty thrilled when they brought out and apple pie in filo dough with coconut sorbet. Yes please. Gracias a dios. Hvala bogu. 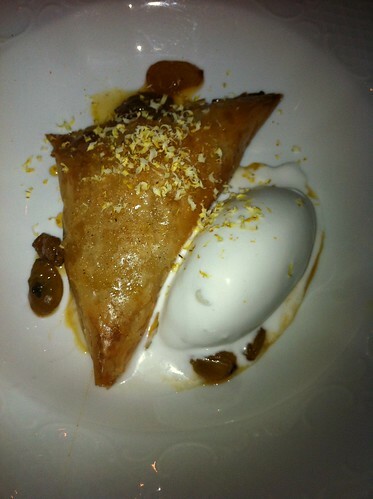 Dessert is critical to a fancy feast and this one did not disappoint thanks to the pastry and ice cream. I was very happy with how the whole thing turned out. I want to thank Lenoir for taking such good care of us. I still haven’t decided where to go next month but if you want to read more about this trip please check out the other participants (aka my friends) and see what they thought. 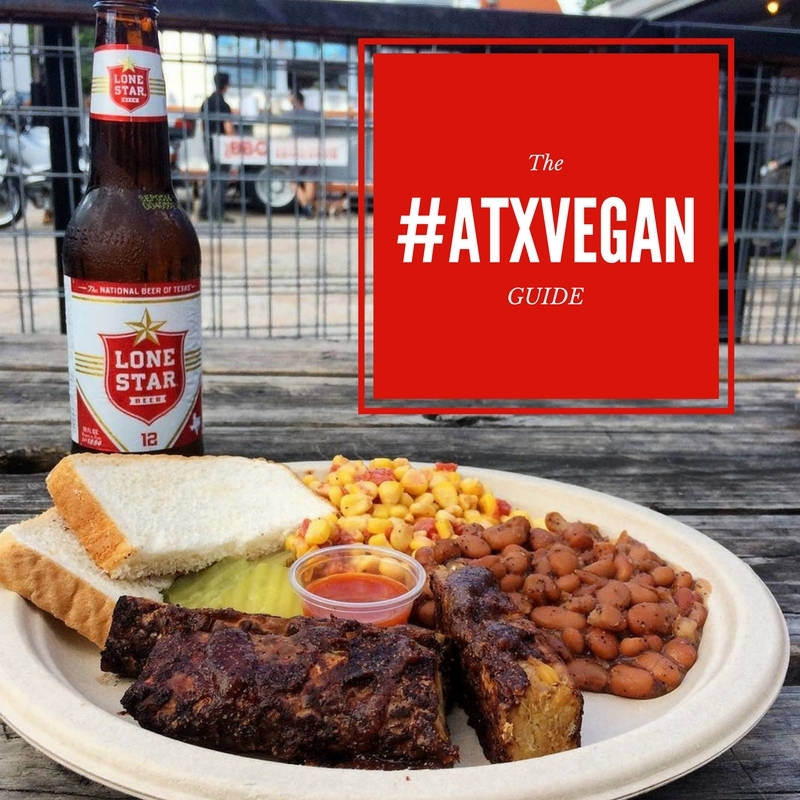 The Lonestar Plate, Rock ‘n’ Realty, and Muy Vegan. 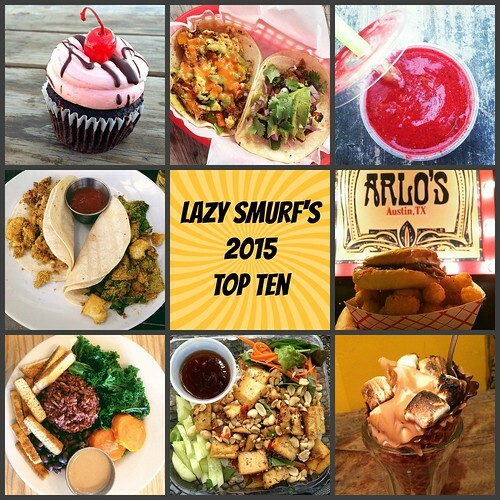 This entry was posted in Austin, Austin Restaurant Reviews and tagged Austin, lenoir, lenoir vegan, vegan, vegan restaurant austin on October 8, 2012 by lazysmurf. I love that idea of having a vegan night at fancy restaurants–though I’d be terrified to try it here. They’d probably give me fish and be like, what, it’s not meat! Sigh. Lenoir looks delicious and, yes, more kale chips for garnish! Great idea! Time for the next Fancy Feast excursion yet? I love the idea that the hippie foods scream “I love the farmers’ market” because I do in fact totally love my farmers’ market. Anyway, someone did a thing like this in Dallas and the result was pretty stunningly bad – the guy who did this wasn’t even a vegetarian, I think, but wanted to see what the high-class places in Dallas could do and was overall disappointed. 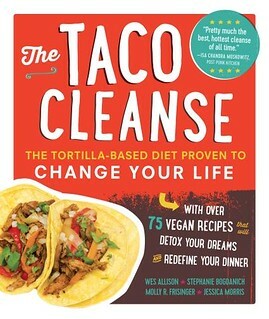 (I tried to find the link but I can’t – I think it was on dallasfood.org, but that doesn’t seem to yield any results). That sounds really funny, and terrible! 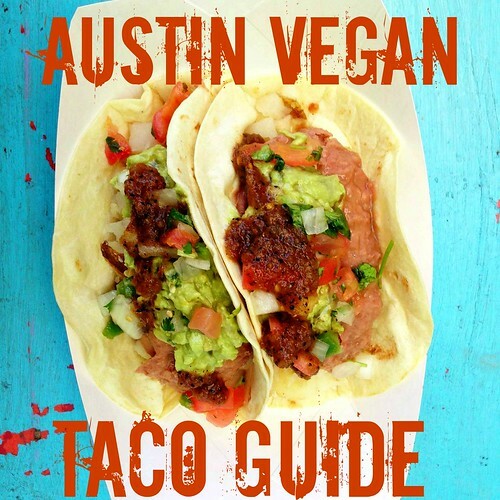 I forget how lucky we are sometimes in Austin that people at least know what vegan means! That sounds/looks so yummy! I am always fearful about asking non-vegan restaurants to make me something. You give me hope though! This is really a great idea! In Madison Wis., the organizer of the Vegan meetup does this exact thing. 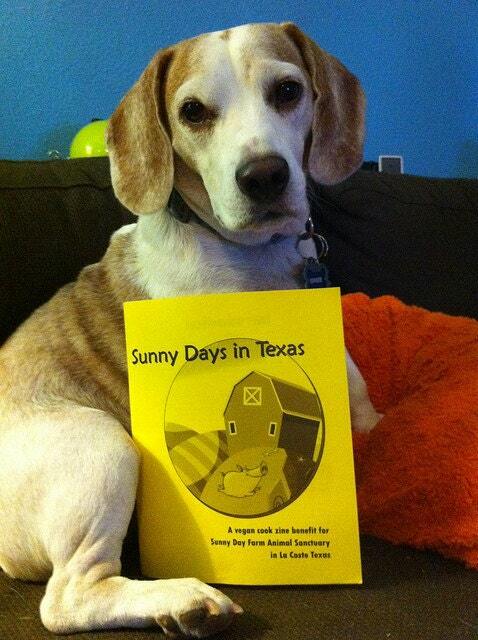 He arranges meetups in restaurants and works with the owners to create a vegan menu. He’s made the city a lot more vegan-friendly. Too bad I don’t live there anymore. This sounds wonderful. I’ve been to Lenoir a couple of times, and it’s gorgeous. They’re super nice and the food is fantastic. 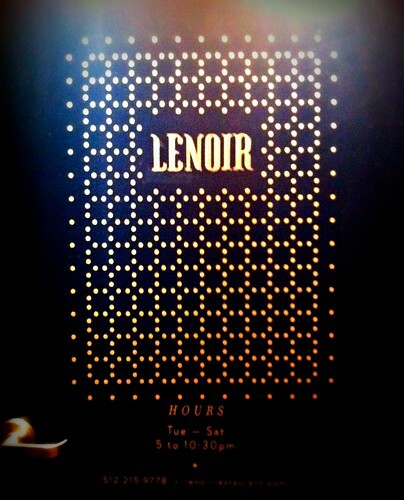 Have been bugging my husband to try Lenoir and he always looks at their menu and says there is not much there for us. From you post it looks like he is wrong and they can do some “off the menu” dishes too. The dinner club is a great idea!